I've never been that big a fan of the western genre of fiction. I usually lean toward science fiction. 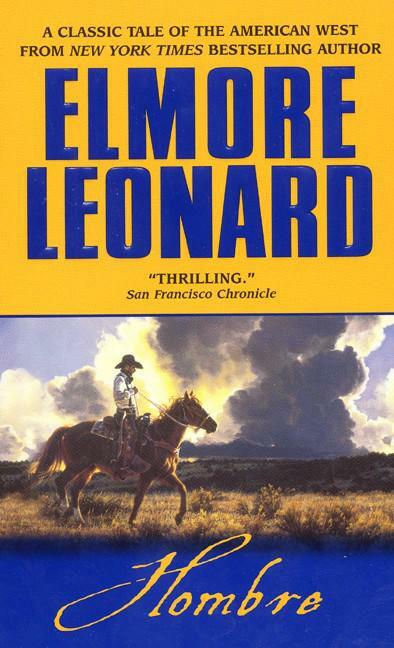 In fact, i think that the only western i've ever read was Larry McMurtry's "Lonesome Dove", which was quite good. I have avoided the western so much, that it took me quite a few years to pick up Louis L'amour's book, "The Walking Drum". I'd always walked right past the L'amour section in the bookstores, always believing that he was just a western writer, and it took the personal recommendation from a friend before i picked it up, and when I did i also found it to be quite good. So, last night, while trying to make some sort of sense out of the mess that is the book cases in my office, i was surprised to come across Elmore Leonard's "Hombré". I'm still not sure how the heck it ended up on my book case. A quick flip through showed that it was only 201 pages of paperback, and being temporarily bored with that vast place called the internet, I figured, " Oh, what the heck, I'll give it a try". It also helped after reading the back cover, to find out that Leonard had written the books on which the movies "Get Shorty", and "Jackie Brown" were based, both of which were fun to watch. John Russell is a white man who was captured as a boy in a raid on his village by the Apaches and raised as one of there own. As the story starts, the narrator of the story is in the middle of closing up his section of a stage coach route, as his company is folding, the reasons for which we are never to know. There is one more run to be made though, as a few people show at the office, unaware of the stage routes closing, and money talks loud enough for the manager to allow one last run. The manager, who is a friend of John Russell, has convinced him after much persuasion, to come and live again among the white man. "Did you think about it", he asks Russell? Russell has but doesn't like the idea. "Well, think about it in english, or think about it in spanish", the manager asks Russell. "I've thought about it in english, and spanish, and apache", is Russell's reply, "but the answer is the same all around". After some consideration though, Russell has decided to go take posession of the property that the manager has told him about, only so that he may sell it and return to his people. That is how Russell comes to be a passenger on that last stage coach run. Russell cuts his hair, dresses as the white man, and off they go. When the conversation in the coach turns to the indians, with most of the passengers taking the standard racist approach, Russell speaks to defend the Apaches. This leads to the passengers mistakenly believing that Russell is himself an Apache, which causes them great consternation, and they take a vote and decide it would be best if Russell not ride inside with them, but on the top with the driver instead. Well, this is a western, they're in a stage coach, so you know something's going to happen, and it's not long before the group is on foot and in dire straits. It doesn't take long for the group to realize that they won't survive long if they don't get the help and guidance of Russell to lead them out of the desert hell that they find themselves in. So, as the tables are turned Russell asks them,"I can't ride with you, maybe you can't walk with me"? I won't ruin the book for you by telling the whole story, but the last two paragraphs sum it up pretty well. ..."Maybe he let us think things about him that weren't true. But as Russell would say, that was up to us. He let people do or think what they wanted while he smoked a cigarette and thought it out calmly, without his feelings getting mixed up in it. Russell never changed the whole time, though i think everyone else did in some way. He did what he felt had to be done. Even if it meant dying. So maybe you don't understand him. You just know him. "Take a good look at Russell. You will never see another one like him as long as you live" That first day at Delgado's Henry Mendez said it all". I would say that "Hombré" was a a transparent metaphor for today's world events, but as it was copyrighted in 1962, I guess I'll just say that the author has pretty good precognition. But then, the more things change, the more they stay the same, and what is right is right, no matter in what language you think it out.